Sea lampreys seem to exhibit panmixia, and studies indicate that anadromous sea lampreys locate spawning habitat based on pheromonal cues from larval conspecifics rather than through philopatry. However, a recent paper in the Canadian Journal of Fisheries and Aquatic Sciences has illustrated that the mechanism by which sea lampreys search for and select reproductive habitat is poorly understood. In this paper, manual tracking of acoustically-tagged migrants confirmed the hypothesis that sea lampreys transition from extensive search to intensive search upon encounter with river water, and return to extensive search upon leaving the plume. This paper documents a previously unknown search tactic used to localise river mouths termed ‘coastal rebounding’. Increased intensive search in the river plume and subsequent approach to the river mouth is hypothesised to occur as a consequence of detection of a pheromone released by river resident larvae that indicate the presence of high-quality reproductive (and nursery) habitat. These findings suggest that partial pheromones constitute information that facilitates the search for river entrances, but prove insufficient to affect the decision to select a habitat. Proposed management tactics that rely on luring migrants into rivers with larval odor may prove ineffective without a complete blend of pheromone components. The above research was undertaken to inform management practices in North America where the sea lamprey is a non-native invasive species. 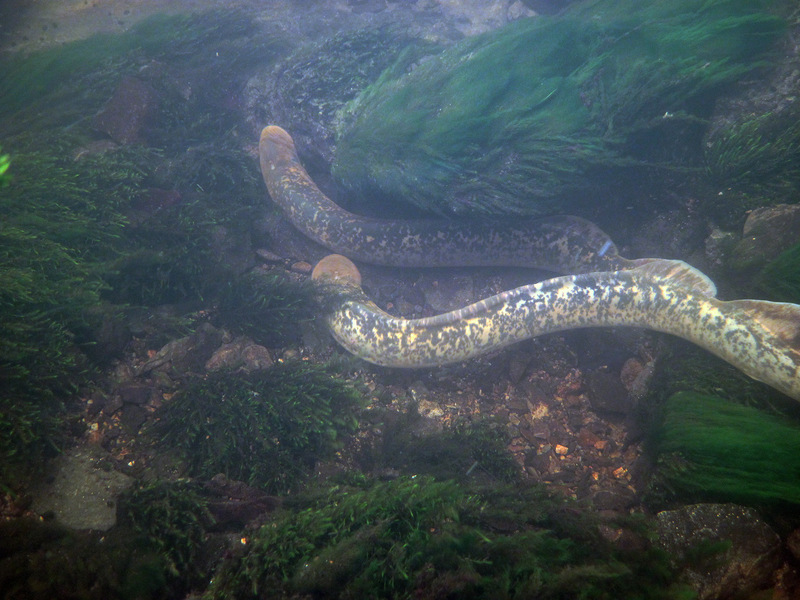 However the finding of this paper may also have implications for management of sea lampreys populations in Irish and other European rivers where they are native, protected and endangered. River works in Ireland, which have removed all lamprey habitats within their footprint (i.e. River Fergus Drainage Scheme, Lower Shannon SAC) in the most important nursery areas for sea lampreys in the river, could potentially lead to adult sea lamprey considering the River Fergus as being no longer suitable for reproduction, due to the absence / reduction of river resident larvae and the pheromones they release. It is clear that if there are reduced areas of nursery habitat and subsequently numbers of juveniles present in a river, adults may stop coming to this particular river to spawn due to the absence of these ammocoete pheromonal cues. Adults in the Shannon estuary may enter the River Fergus plume, for example, and then return to this “extensive searching” after deciding not to ascend into this river due to the reduced levels of river resident larvae and habitats. Meckley, T.T., Michael Wagner, C.M., & Gurarieb, E. (2014) Coastal movements of migrating sea lamprey (Petromyzon marinus) in response to a partial pheromone added to river water: implications for management of invasive populations. Canadian Journal of Fisheries and Aquatic Sciences, 10.1139/cjfas-2013-0487. It is noted again that the Environmental Impact Statement for the River Fergus (Upper, Ennis) Drainage Scheme stated that there would be no instream works. No Natura Impact Statement was prepared. This project removed all of the high-quality reproductive and nursery habitat in the footprint of the works, and there was no mitigation provided for the loss of these habitats. These works may therefore be having indirect integrity level impacts on the SAC that they we are only at the very beginning of understanding. This Lower River Fergus is part of the Lower Shannon Special Area of Conservation for lampreys, with brook, river and sea lampreys listed as key conservation interests. Is anyone really protecting lamprey in Ireland? For further information on lamprey in Ireland please do not hesitate to contact us.